Paul Gascoigne’s infamous tackle on Nottingham Forest's Gary Charles, during the opening minutes of the 1991 FA Cup Final, was one of the most reckless challenges Wembley has ever seen. As fans remember, the lunge was so wild that Tottenham’s Gascoigne was stretchered-off - and Charles was left hobbling. But the reaction of the rest of the Forest players to Gascoigne's assault is often forgotten. To a man, they remained calm. Because their manager was Brian Clough. And Brian Clough’s players never argued with referees – or considered retribution. The Forest players of the day were clean-cut, well-behaved, model professionals. They were always respectful of the club and its fans. Clough believed his team should be role models for the local community they represented. 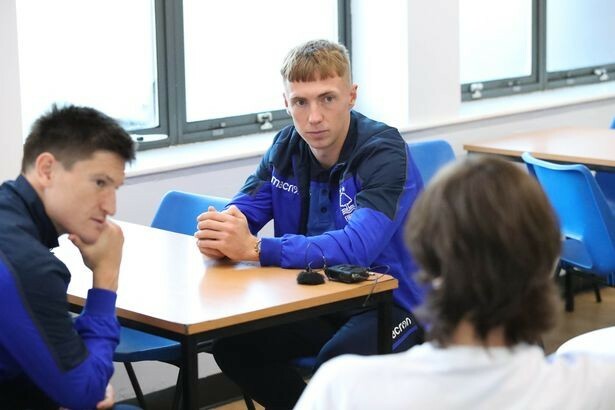 Which is why he would, presumably, have enjoyed seeing two of the current team’s young stars, Ben Osborn and Joe Lolley, visiting a homeless shelter not far from the City Ground. This summer, Forest adopted homeless charity Framework as a partner for this season. It wants to help raise £200,000 for the charity, which makes contact with dozens of local rough-sleepers every night. In the last six months alone, Framework has had 23,000 calls to its rough-sleeper hotline. As part of the partnership, Framework staff showed Osborn and Lolley some of the places around the city centre – derelict buildings, back alleys, around rubbish bins – where homeless people sleep. Then they took them to the shelter on London Road. A video produced by Forest and Framework shows 24-year-old Osborn and 26-year-old Lolley chatting to residents. They look interested and engaged. They obviously didn't need much persuasion to be there. Spondon-born Osborn said: “Homelessness is a big problem in this country. It looks like the numbers are rising. “That’s why it’s important that associations like Framework (can provide) hostels like this, where people can stay to take that first step in getting back to normality. “It’s huge. Raising awareness can only be a good thing." And it isn’t only Brian Clough who would approve. Forest owner Evangelos Marinakis has had his staff work hard to bolster the club’s local community credentials since he took over the club 17 months ago. The millionaire shipping magnate is well known for his philanthropy in his home country of Greece, where he has built parks, playgrounds and sports facilities. Although his business dealings have sometimes attracted controversy, several times he has provided food and clothes for refugees who have washed up on the shores of Greek islands. He also donated one million Euros to help victims of this summer's wildfires in Greece. Marinakis’ ownership of Forest has seen the club build new relationships with Nottingham schools, businesses, charities and other sports teams. The club’s partnership with Framework - which came after Forest players helped serve Christmas lunch at another shelter, last year - was a decision taken right at the top of the organisation. Forest chairman Nicholas Randall QC, has said: "It is the ambition of Mr Marinakis to not only achieve success on the pitch but for the club to recognise its obligations to the local community. Later this month, hundreds of people are expected to camp outside the City Ground, as part of Framework’s annual Big Sleep Out. The event will raise more than £20,000 to help the charity’s work with the homeless. Last month, Forest teamed up with the High Sheriff of Nottinghamshire Nick Ebbs to stage a fundraising dinner at the City Ground – and bang the drum for Framework, in front of local business and civic leaders. At the end of the night, European Cup winner and former Forest manager and chairman Frank Clarkrecalled how Brian Clough always wanted his Forest players to be actively engaged with their community. Clough famously took his team down a Nottinghamshire pit, to show them how tough life often was for ordinary working people. During the 1984 Miners’ Strike, Forest also provided meals for the families of striking pitmen. Today Framework is hoping the club's new owners can follow in Clough’s footsteps, to provide a helping hand for another generation of locals. Anyone who wants to join the Big Sleep Out at the City Ground, on Saturday November 24, can find details here.